KUALA LUMPUR (April 16): Apart from reducing the East Coast Rail Link (ECRL) construction cost by RM21.5 billion, the government revealed that the Chinese state-owned China Communications Construction Company Ltd (CCCC) has agreed to operate and maintain the project through a 50:50 joint venture (JV) with Malaysia Rail Link Sdn Bhd (MRL). Prime Minister Tun Dr Mahathir Mohamad told the media yesterday that the project’s engineering, procurement, construction and commissioning (EPCC) contractor has agreed to participate in the operation and maintenance (O&M) of the rail link that runs through five states and Putrajaya. CCCC will provide technical support and share the operational risk upon completion of the project, he said, noting that such arrangement will ease the financial burden on Malaysia, which had to bear the all O&M costs in the previous contract signed by Barisan Nasional government. “In addition, Malaysia can also leverage on CCCC’s expertise in operation and maintenance (O&M), hence improving the long-term viability of the project. “We are confident that CCCC’s involvement will attract and spur investment along the rail link corridor, especially from China,” said Dr Mahathir, highlighting that if the government were to cancel the project, it [would] have to pay compensation of RM21.78 billion,” he said. Having the Chinese counterpart to agree on shouldering the operational risks of the RM44 billion tran-state rail link project is seen as a rare case, if not an achievement. For that, the 93-year-old leader might have raised many eyebrows at home and internationally that his administration has been able to renegotiate for a fresh deal. Dr Mahathir was swamped with questions from the local and foreign media at the packed conference room surrounding the revival of the ECRL — the project that was started by former prime minister Datuk Seri Najib Razak, who yesterday was in the dock at the High Court here for his trial related to a former subsidiary of 1Malaysia Development Bhd (1MDB). 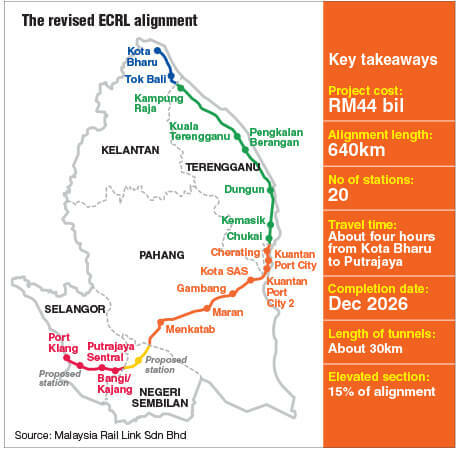 Q: When will the ECRL construction resume? Dr Mahathir: As soon as we sign the agreement. Q: What is the total cost to construct the ECRL, including interest expenses? Dr Mahathir: The cost has been reduced to RM44 billion, and obviously the interest rate would be based on a smaller amount of money. It is a considerable saving for us, which means interest payments will be far less than the original (interest) cost of RM66 billion. Q: Did the ECRL negotiation involve the export of palm oil to China? Dr Mahathir: Well (it is) not directly related, but we are taking advantage of the signing of the agreement to work out the purchase of palm oil by China ... that will happen. Q: What is the quantum of interest reduction? Dr Mahathir: I don’t know, it wasn’t state here, if at all you’ll find in the statement that we are going to release. Q: What is the schedule of resuming construction of the ECRL? What is the payment schedule to CCCC? Dr Mahathir: We will start as soon as we sign the agreement, as you know part of the work has already been done, we have to continue with that work. As far as payment is concerned, we will pay according to the progress of the construction. Q: Through this negotiation, can the government establish that the ECRL is a scam? Does it come with any trade-offs? Including the investigation of the whereabouts of Mr Jho Low? Dr Mahathir: It has nothing to do with Mr Jho Low, but of course we will seek the help of the Chinese government if at all he is in China. When we reduce the cost, the interest rate also goes down, there may be other areas where the costs will be reduced, and this will be worked out later on. Q: Under the new agreement, CCCC will be involved in O&M. Was this included in the original plan? Dr Mahathir: In the original document there was nothing about Malaysian share of the construction, but now we include also the participation by the Malaysian side in the construction of the rail. Q: Who is going to bear the cost for suspending the ECRL? Dr Mahathir: That has not been mentioned. We will start as if there have been no interval between the stop of the construction (in July 2018) and the beginning of the construction. Q: What is the government’s consideration in changing the route? Dr Mahathir: That was because of the structure of the mountains along the way. If we want to do that we need to do a lot of tunnels, and also the material there is more silica, silica that we can use for other purposes, so we don’t want to disturb that deposit. Q: Does the change of the ECRL alignment affect ticket prices? Dr Mahathir: That has not been worked out yet, we will have some say in determining the operation of the rail line, so we will have some influence over the ticket prices, et cetera. Q: How was the discussion between both parties’ negotiation teams? Dr Mahathir: I think they have worked quite well together, obviously we have achieved quite good success by reducing the cost by RM21.5 billion. That is a lot of money, which we can see it can be done at a lower price, and yet the previous government agreed to a lump sum of RM66 billion. We are saving a lot of money, and also the interest rate on a smaller sum of money that we have to pay. Q: Is it true that the previous government inflated the ECRL cost to repay loans and interest related to 1MDB? Dr Mahathir: We suspect that was what happened, because the price was so high. And (now) we can reduce it by as much as RM22 billion. Had the project been tendered out in the usual manner, we would have gotten a better price, but this was a lump sum given to a company from China, through direct negotiation and award of the project to the Chinese company. Q: Is the Trans-Sabah Gas Pipeline still cancelled? Dr Mahathir: We have determined that the pipeline will not be constructed. We are, as usual, not sticking directly to previous arrangements, and at the moment we are not going to construct the pipeline. Q: Do Malaysian contractors have the capacity to participate (in) 40% of works in the ECRL? Dr Mahathir: It depends [on] the contractor, how they prepare to work with Malaysian contractors. But that is the agreement, 40% of the work must be done by Malaysian companies. Q: You were a strong critic of the ECRL, that we might fall into China’s debt trap. Have those concerns died away? Dr Mahathir: Our concerns were there, but this is a solution to our concerns. When we were still in the opposition, we thought that the way the award was made and the sum total of the cost was not right, it was inflated. And as you can see, they can do this project with much lower cost. So why should the Malaysian government agree to a higher cost? This is something we cannot understand. Q: How do you view Chinese-backed mega projects now? Dr Mahathir: Well, if there are mega projects that we can give to the Chinese, we will. But our policy is to give mega projects to Malaysian companies, if they don’t have the expertise, they can call in some foreign companies to join them. Q: What enticed China to accept Malaysia’s proposal to continue the project? Dr Mahathir: I think the Chinese government is aware that we are facing financial problem, and (the) cost agreed (to) in the past is too high, we have proven that other companies can construct this railway at a lower cost, so that is why Chinese government has agreed. Q: Will there be any grace period before the first payment? Like the seven-year grace period in the first agreement. Dr Mahathir: Normally we don’t enter into an agreement or contract that we have to pay according to the timeline, I suppose that will has to be dropped, and it must be based on work progress. 1. CCCC to form 50:50 JV with MRL, sharing operational risk after project completion and providing technical support. 2. CCCC to refund part of RM3.1 billion advance payment paid for phase two of ECRL, of which RM1 billion to be refunded within a month after April 12, 2019. Balance to be settled within three months. 3. CCCC agrees to increase local participation to 40%, from 30% previously. 4. Government has to pay RM21.78 billion termination cost if it decides to terminate ECRL. 5. ECRL cost reduction due to “value engineering exercise” and revised southern alignment by avoiding Bentong-Gombak 17.8km tunnel. 6. ECRL construction cost to be paid based on work progress. 7. Loan from China-Exim Bank to reduce “substantially”, exact amount still being negotiated. 8. ECRL cost per kilometre reduced to RM68.7 million, from RM95.5 million. 9. Putrajaya not compromising 1MDB investigation in favour of lower ECRL cost from CCCC. 10. Government suspects previously inflated ECRL cost and loan meant to repay 1MDB debts and interests.